Home maintenance is a required part of owning and renting a home. One of the most overlooked things is something that’s often out of sight, out of mind; it’s your gutters! Here you will discover just how regularly to keep your gutters clean and why it’s so important to keep them that way. This will insure you never have to worry about fixing any faulty, too-stuffed gutters again! When is the right time to clean my gutters? A good rule of thumb is to make sure you clear your gutter at least twice a year. Best times to do this would be springtime and then near the end of summer/beginning of fall. After the rainy seasons hit, you’re going to want to clean out your gutters. Different types of trees in the yard may require a bit more maintenance, such as pine trees being present could result in cleaning your gutters every three months rather than twice a years. What’s the big deal about cleaning gutters anyway? Isn’t the rain supposed to flush it all out eventually? Your gutters work like any typical drain type system, and if a backup is present, it can cause issues for your gutters and even your roof. A backed-up gutter can cause weight to build up on the roof and trap moisture, potentially starting a leak in certain parts of the roof. This type of debris build up in your gutters can also cause water damage to the interior and exterior of the walls, causing lifts in paneling or other wall fixtures and creating unsightly future issues that could have easily been avoided with a biannual cleaning. 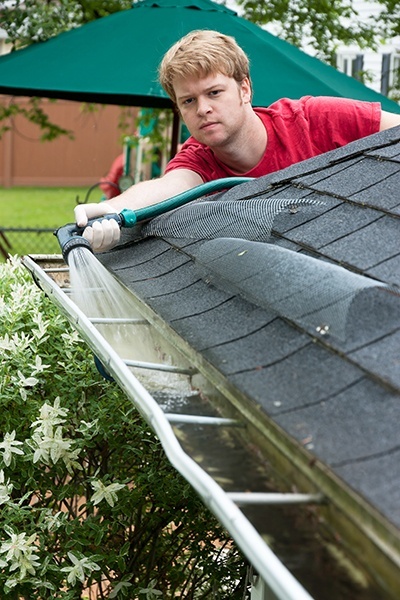 Keeping your gutters clean can save you a lot of hassle in the long run. It can be a pain, but thankfully it’s a pain that only has to occur twice a year in most cases. A clean gutter keeps a home happy!